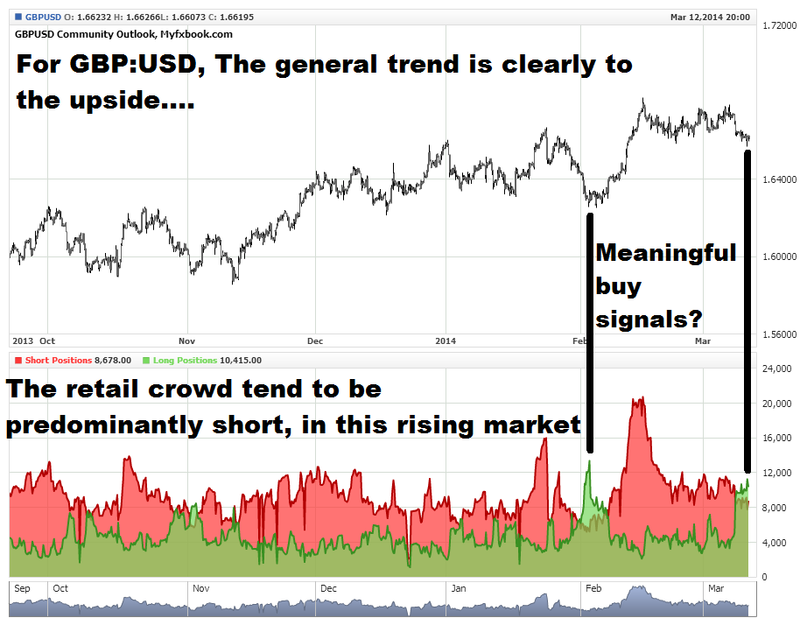 As part of an ongoing series, I’m keeping one eye on the relative Long and Short positions of retail Forex traders. Does this information provide any trading clues? Let’s try and find out. A generally rising market, in which the retail crowd are generally… short (?) ! 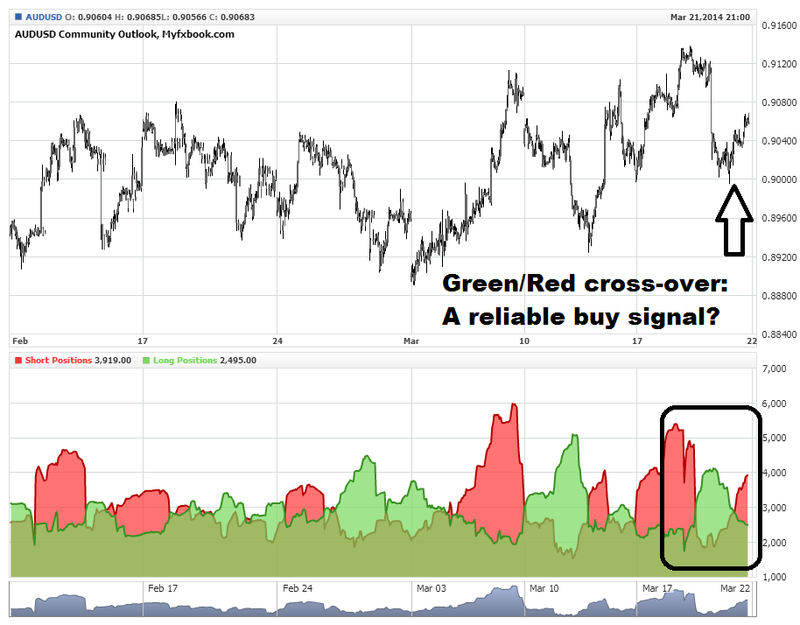 The recent and sudden initiation of long positions and subsequent reversal to net short (the green/red cross-over) may signal a good buying opportunity below 1.38000. 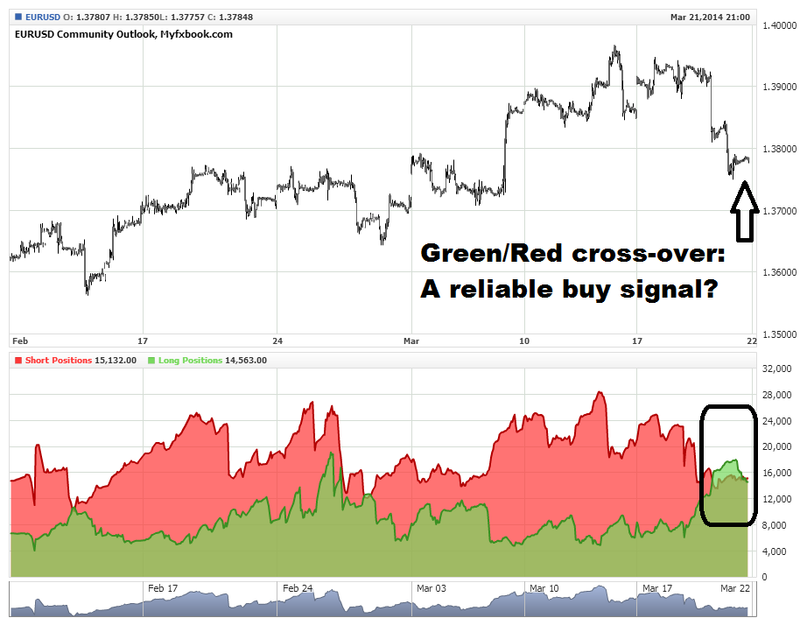 Did the Thursday/Friday green/red cross-over provide a reliable buy signal? Despite the recent rally, I’m still calling this a down-trend. 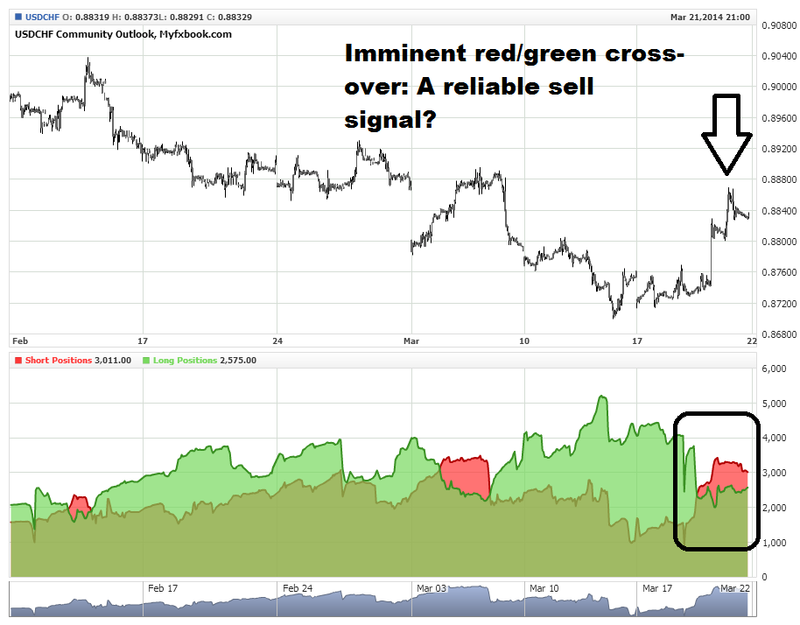 Are we about to witness a red/green cross-over and potentially a reliable sell signal? A clue from the retail crowd? I have to admit, I was surprised by the failed rally on GBP:USD over the last several hours. In earlier blog posts this week I revealed my interest in the temporary “cross-over” of retail long & short positions – in other words, the temporary cross-over from green to red highlighted in the screenshot below. I’ve seen this pattern occur on several major currency pairs, on a number of occasions, and it has preceded a continuation of the prevailing trend. 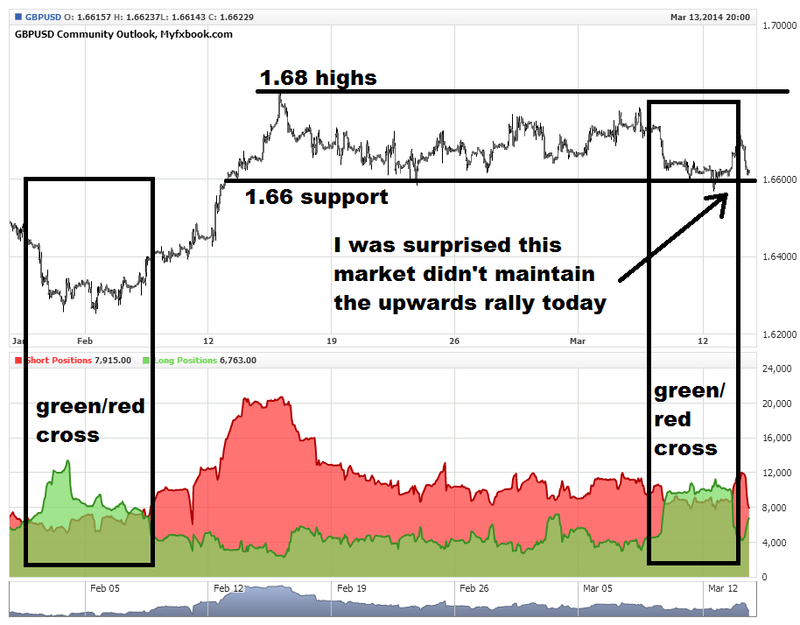 This market has been experiencing a gradual upwards trend and, having already found support at 1.66000, the green/red cross-over flagged up a possible attack of the 1.68 highs. It wasn’t to be (yet?). As part of a running series, I’m interested to see whether there is any value in closely watching the positions of retail traders, in Forex Markets. Taken from http://www.myfxbook.com/community/outlook/GBPUSD in this instance, this evening I’m openly wondering if we might have a good pull-back and buy opportunity arising on GBP:USD? Time and again I’ve noticed Retail traders position themselves against the prevailing trend. I don’t know why they do it – my guess is they are determined to catch the tops/bottoms (which I’d argue is a fools game). But further to that, does it mean anything at all when they collectively switch from net Short to net Long (i.e. the green crosses above the red area, or vice-versa)? Retail positioning in Forex. Does the long/short cross-over signal a buy opportunity?